Crispy Chicken Drumsticks are my go-to better for you comfort food! They are easy to prepare and absolutely delicious! The chicken is crunchy and full of flavor! Baking the chicken gives a crunchy coating without adding extra calories or mess from frying! Enjoy oven baked chicken drumsticks any day and be sure to pack these for picnics and beach days! 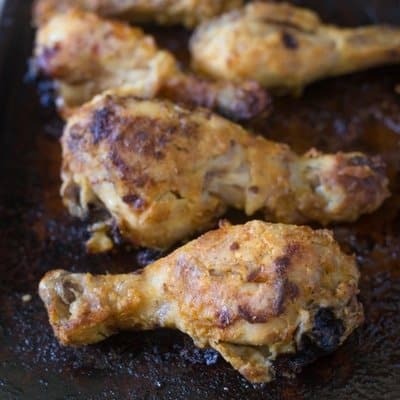 Baked Crispy Chicken Drumsticks are so crispy and juicy! My love of crispy chicken legs runs deep. It took me a bit of time to figure out an oven baked chicken recipe that blows away fried chicken but I did it! 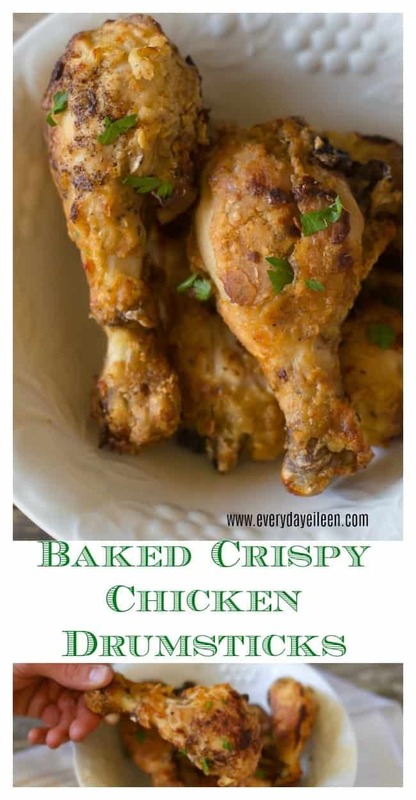 This is an amazing crispy drumstick recipe that will not disappoint. If you prefer to remove the skin, the crispy coating adheres well to the drumsticks. Frying foods is full of unhealthy fats and calories. Marinate the chicken in seasoned buttermilk adds flavor to the chicken. The flour coating can be gluten-free, almond flour, or regular ap-flour. Use whatever works for your family. Fried Chicken is amazing but the calories and any heavily fried food, I just can’t do it! I made it a mission to create a really awesome crispy chicken drumstick recipe that is baked! These chicken are going to blow you away! So so good! Whether you want to keep the skin on the chicken or as I do, remove and discard the skin. The coating is flour and another set of seasonings including garlic powder, onion powder, salt, black pepper, and paprika. Layering the flavors makes an amazing baked crispy chicken drumstick. Why marinate the chicken in buttermilk before baking the drumsticks? The buttermilk adds flavor and is a tenderizer for the chicken before it is baked. Placing the chicken in the buttermilk also helps the flour to adhere to the chicken. How long should I marinate the chicken in the buttermilk? I would marinate no less than 30 minutes. I have marinated the chicken overnight when I have the time. How long can crispy baked chicken drumsticks keep in the fridge after being cooked? Cooked chicken drumsticks can keep well covered/wrapped in the fridge for 3 days. Can these baked chicken drumsticks be frozen after they are cooked? Yes, this recipe is freezer friendly. Once the chicken is cooked and cooled, the drumsticks can be placed in portions of your choice in freezer bags. Date the bags and ensure most of the air is removed from the freezer bag. The baked chicken can be stored in the freezer for about 3 months. 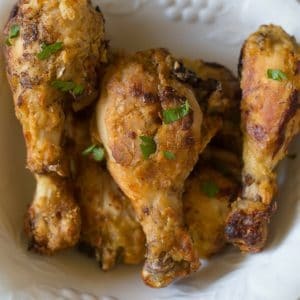 What can I serve with this baked chicken drumstick recipe? Easy Roasted Crispy Potatoes:These potatoes are absolutely delicious! Slow Cooker Baked Beans: A super easy recipe for some amazing baked beans! Red Lentil Salad: A tasty and easy salad! Creamy Stovetop Mac and Cheese from Love Bakes Good Cakes, what can I say, stovetop mac and cheese rules! Mashed Potatoes with Cream Cheese from Fearless Dining, these are amazing taters! These crispy chicken drumsticks are super juicy and delicious! My family is a huge fan of easy chicken recipes! Another of my most popular chicken leg recipes is Marinated Chicken Drumsticks! These are quite popular with my family and always requested for family parties! For a healthier option, remove the skin from the drumstick and discard. In a large bowl, place the buttermilk, hot sauce, onion and garlic powder, black pepper, and salt. Add the chicken and cover with a lid or plastic wrap. Place in the fridge for at least 30 minutes, overnight is recommended. In a medium bowl or large plastic bag combine the flour, thyme, smoked paprika, black pepper, and salt. *cayenne pepper if you like a kick. 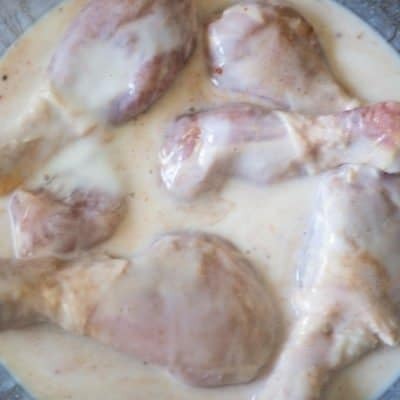 Once the chicken has marinated, remove from the buttermilk and shake excess liquid from the chicken. Place 2 teaspoons of unsalted butter on the baking sheet, place in the oven to melt the butter for about 1-2 minutes. Remove the baking sheet from the oven. 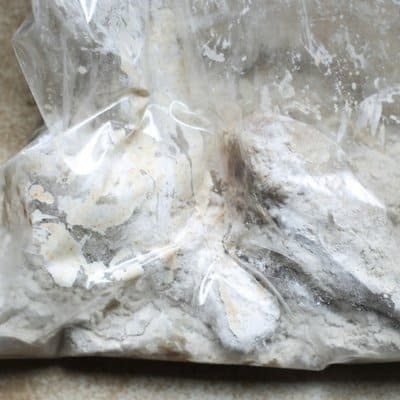 If you chose a bag to place the flour mix, add a few pieces of the chicken into the bag and close it. Shake the bag so flour covers all the chicken pieces. 6. 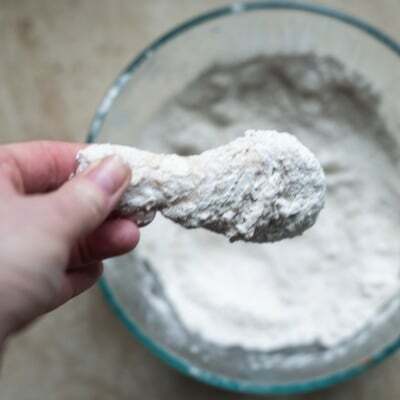 The bowl method, add a piece at a time to dredge the chicken in the flour and shake off any excess flour. 7. Place the chicken drumsticks onto the buttered baking sheet. Bake for 45 minutes. 8. The internal temperature of the chicken should be 185 degrees to have moist delicious chicken drumsticks. Are you loving this baked chicken drumstick recipe, giving it a 5-star rating is super helpful for me and very much appreciated! Oven baked crispy chicken drumsticks are always a great crowd-pleasing meal. Perfect addition to a beach day and picnic. The chicken is marinated in seasoned buttermilk then dredged in a seasoned flour for a double layer of flavor. Baked not fried keeps this low-calorie. In a large bowl add the buttermilk, hot sauce, smoked paprika, black pepper, salt, onion powder, and garlic powder. Mix to combine the ingredients. Add the drumsticks to the bowl. Cover the bowl with a lid or plastic wrap. Refrigerate at least 30 minutes, overnight is preferred. Preheat oven to 425 degrees. Once heated add the unsalted butter to a large baking sheet and place on the center rack of oven for about 2 minutes to melt the butter. Once the butter is melted, remove the rack from oven and set aside. In either a large bowl or plastic storage bag, add the flour, smoked paprika, salt, pepper, and if using the cayenne pepper. Mix ingredients. If using the large bowl, add the drumstick marinated pieces, shake excess marinade off before placing chicken in the flour mixture. Dredge the chicken in the flour and again, shake off excess flour. Place on the buttered baking sheet. Do this with all the chicken. Using the storage bag method, combine 2 - 3 pieces at a time to the bag. Seal and shake to coat the chicken with the flour mixture. Remove the chicken from the bag and place on buttered baking sheet. Do this with all the chicken. I prefer using low-fat buttermilk. Full-fat buttermilk (which is still not very fattening) can be used. It is a personal choice about leaving the skin on the chicken. My family does not eat the skin, so I always remove. This recipe is based on skinless chicken drumsticks. Please adjust calories if not removing the skin. 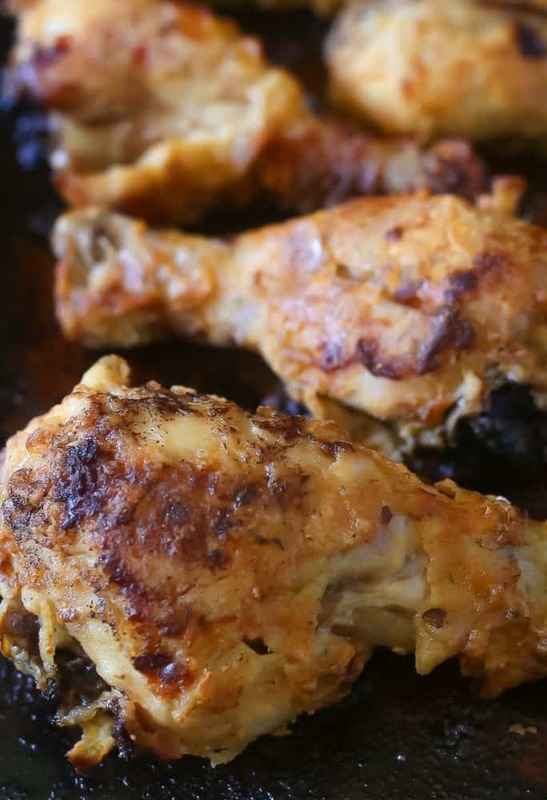 I love the flavor of smoked paprika in this crispy baked chicken. Regular paprika works if you do not have the smoked paprika. Could I use skinless, boneless chicken breasts, do you think? Weight Watchers allows white chicken meet to have zero points, so just the breading would count!? Jill, absolutely use skinless boneless chicken breasts. I make them all the time with this coating and they are delicious. I bake for about 20 minutes and they are done. Let me know how it works for you too! Enjoy! Is there a more perfect picnic food than chicken? I agree Ellen, a favorite picnic food. Yasss! That is some good looking chicken right there! I love baked chicken because it tends to keep the insides juicy while retaining that crunch on the outside! Your buttermilk looks delicious too! Great tasting and healthy I can always live with! thank you so much, so agree about keeping the juices inside the chicken to keep the chicken moist. I hope you enjoy Femi. It has been too long since I had a crispy chicken leg! These look awesome! I love that you baked instead of fried! Thank you, Sara, baked is so much better and healthier. Glad you enjoy! I’ll be honest I love fried chicken but I’ve always been a little intimidated by it. I love that you managed to get all of the flavor of buttermilk fried chicken into a baked version. Can’t wait to try this! I can’t believe these are baked and not fried! They look delicious and so incredibly crispy!! Pinning this! We are planning a lot of get-togethers this Spring and Summer. These chicken drumsticks are perfection! Karyl, awesome, I hope you enjoy! Those are beautiful! Most oven-fired chicken I’ve seen (and eaten, and made…) doesn’t brown that beautifully. I have to try your method! This has to be the perfect chicken drumstick recipe! These look so amazing! How did I miss out on National Picnic Day?! Fried chicken is such a perfect picnic food. My 6-year-old absolutely loves drumsticks, and the crispier, the better! This looks like a dish that would totally hit the spot! These look super crispy and really easy to make! I can’t believe they’re baked and not fried. I wonder if I could get the boys to try these. They look amazing! You know your chicken!! Yum! I have been meaning to put drumsticks in our dinner rotation again soon. This recipe look super tasty. Jenni, these are a family favorite. I hope you add it into your dinner rotation soon. I love that these are marinated in buttermilk, they must be so delicious. trying this next time! Thank you Carrie. The buttermilk adds amazing flavor. I usually buy drumsticks at KFC… but my mother can go well with this recipe, thanks! Condrut, ask your Mom to make these and you won’t eat KFC again :), trust me. Thank you so much for stopping by and let me know when you try there! I really wish I could reach through the screen and grab a piece, looks so perfectly crispy and delicious. And I love that it’s baked! Thank you, Jolene, these are delish and crispy.I hope you enjoy. Gorgeous photos! So crispy too! 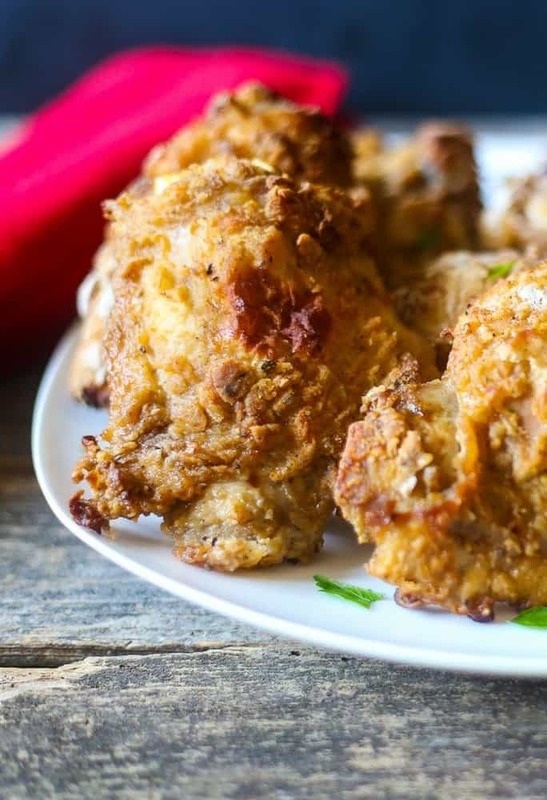 These look delicious – so excited to try a healthier alternative to a classic fried chicken at my next picnic! Thank you Liz.These are much healthier and no one misses the grease from deep frying. I really do think these are going to make it onto my MUST MAKE LIST!!! YUMMY!!! Awesome Colleen,I hope you enjoy as much as we do! Those look delicious, Eileen. Can’t wait to try these. Thank you Camilla. They are delicious! Love this lightened up version. I often use buttermilk for my fried chicken. Happy to know that I can bake it with wonderful results. I hope you try it baked, so good.